We engage in hot insulation services, hot insulation and boiler insulation. We check the quality of our services on the various points chiefly eco friendliness, insulation efficiency, performance. 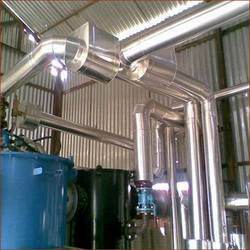 We also offer boiler insulation services for boilers of various sizes and numerous industries. It is through our boiler insulation that we have been catering to the various insulation requirements of industries. Along with our standardized services, we are also capable of customizing our services as per the requirement. Hot Insulation Services are done to increase the durability and efficiency of various machines and equipment. Our experience and expertise in the industry has enabled us to offer hot insulation solutions in an industry specific manner. We are also capable of offering customization solution as per the individual requisite of our clients.